At our company, we work and provide reliable curtain dry cleaning service. Choose us for the best curtain dry cleaning service in Kuala Lumpur and Selangor, Malaysia that meets your needs. 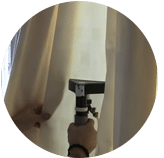 When you have curtains that need to be dry washed, it becomes essential to choose a reliable company that provides curtain dry cleaning service. 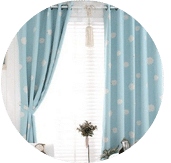 Often some types of fabrics for curtains manufactured today are not suitable for washing with traditional cleaning methods and water as it might damage the material. These curtains come with instructions to be dry wash. And that becomes the reason to look for a dry cleaner. Before finding a dry cleaner that meets your needs, it is important to ensure reliability and that the company can provide you with quality cleaning and customer service. Good customer service is the most valuable aspect of a reliable dry cleaning service provider. 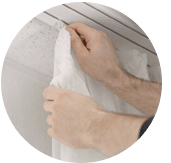 Reliable curtain dry cleaners should also be assisted by a friendly team, attentive to your requests and well informed and willing to provide telephone support and clarify any customer queries regarding the cleaning process. Never choose a curtain dry cleaner or send your curtains to the laundry based solely on the price factor. If you want a good quality service, you should use a curtain dry cleaner company that offers you an overall value in terms of service, quality and price. The company that offers the lowest price may not be able to provide the results you want and it will cost you more than necessary if you are using them. 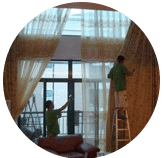 If you need the best quality and the best standards for your cleaned curtains, it is important that you choose a service that charges reasonable costs and offer good care for your curtains. This is one of the most important factors customers should expect from a house curtain dry cleaner. 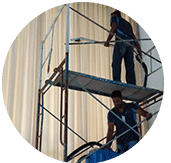 The employees of the business service you pick to use should be able to give a specific time for cleaning your curtain items and keep it ready for you to be picked up after that time or provide delivery and send it to your location. And it is necessary that your drapes and curtains for your shop window are clean and free of stains and dust, and dirt are being remove from the surface. Never think that all dry cleaners are identical and offer the same type of service. 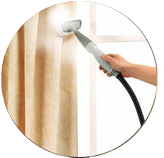 Each curtain dry cleaning service has its own equipment and uses different skills to clean the curtain materials. So be sure to choose a dry cleaner whose main objective is customer satisfaction. Look no longer for a solution and let us help you. Please contact our customer service team today via call or drop us a message right now for a free new professional curtain dry cleaning service quote! 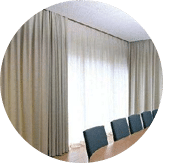 Our customer service team will reply to your request within a few working hours to find out more and discuss further about the curtain dry cleaning service that you require. Subsequently, we will issue you a quotation and an invoice for the curtain dry cleaning service. 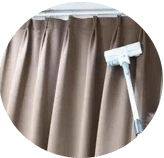 Our curtain dry cleaning service is available in Peninsula Malaysia from Kuala Lumpur, Selangor, Ipoh, Johor, Malacca and Penang. Speak to our team to enquire more about the curtain dry cleaning service that we provide in your area. 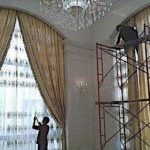 I have a special request for the curtain dry cleaning service, can this be done? We understand that sometimes our customer have special requests for curtain dry cleaning service with regards to timing and other matters. In this scenario, you can contact our customer representative team at 017-232-6491 to discuss your curtain dry cleaning service request.